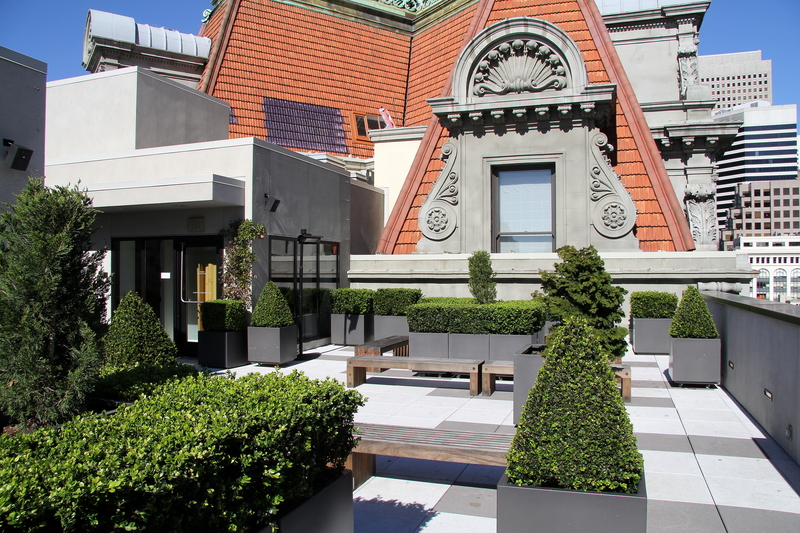 In today’s guest post William Wyckoff, author of How to Read the American West: A Field Guide, takes us on a tour of the rooftop gardens of San Francisco. A geographer and an accomplished photographer, he provides a fresh perspective on the natural and cultural landscapes of the American West. In his book and in this guest post, Wyckoff encourages us to see the places where we live, work, and visit in a new light and to reconsider commonly held stereotypes about the American West. One of the joys of assembling How to Read the American West was simply visiting different kinds of places with my camera and a good pair of walking shoes. A recent trip to a conference in San Francisco gave me another chance to explore. In the book, I describe various downtown landscapes in western cities, especially so-called “Mega Civic Landscapes” (Feature 72) and “Mega Consumer Landscapes” (Feature 73), and a free afternoon at the conference allowed me to see how a growing number of rooftop parks and gardens are adding a high-rise dimension to these urban spaces. This entry was posted in Environmental History and tagged outdoors, San Francisco on April 30, 2014 by uwpressblog. In China today, does poetry still matter? In Verse Going Viral: China’s New Media Scenes, Heather Inwood unravels a paradox surrounding modern Chinese poetry: while poetry as a representation of high culture is widely assumed to be marginalized to the point of death, poetry activity flourishes across the country. She finds that this ancient art form has benefited from China’s continued self-identity as a nation of poetry (shiguo) and from the interactive opportunities created by the Internet and other participatory media. In today’s guest post, Inwood provides a glimpse into some of the myriad ways the digital revolution has impacted the role of poetry in contemporary Chinese society. There’s a famous Chinese saying that “the misery of the state leads to the emergence of great poets” (guojia buxing shijia xing)–or more literally, “when the state is unfortunate, poets are fortunate.” These words come from a poem by the Qing dynasty historian Zhao Yi (1727–1814), observing the phenomenon in which classic works of poetry often appear during times of calamity: war, famine, dynastic downfall, and so on. 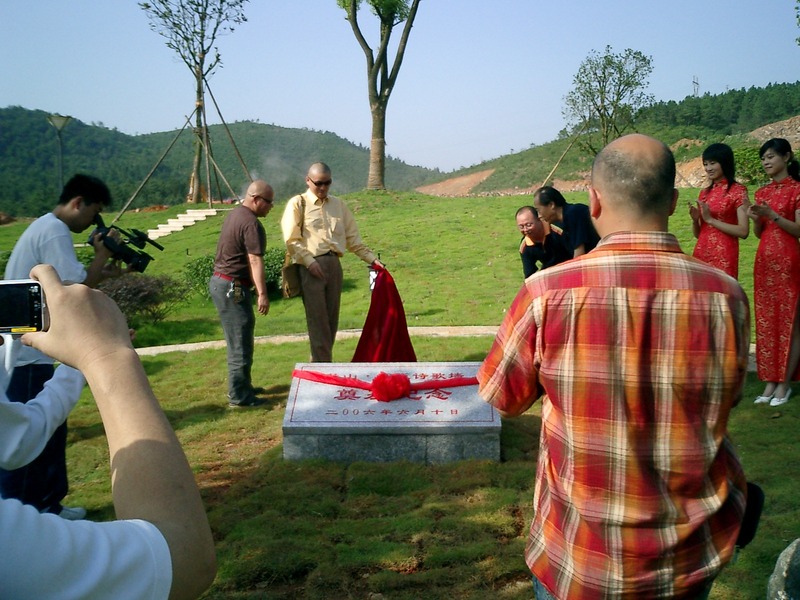 The poets Yu Jian and Mo Mo unveil a plaque celebrating the relationship between poetry and real estate at the Lushan Villas complex in Changsha, Hunan, June 2006. Zhao Yi’s saying sprang to mind for many observers of Chinese poetry after the Sichuan Earthquake of May 2008. The loss of nearly 70,000 lives spurred an outpouring of poems that were widely circulated on the Internet, in newspapers, on television and radio, and recited at fundraising events. As a form of writing that “follows from emotion” (shi yuan qing), poetry is ideally placed in times of turmoil and tragedy. When things go wrong, you can trust that poets will find a way to put into words what many are thinking and feeling. This entry was posted in Asian Art, Asian Studies, Current Events, Guest Post and tagged China on April 24, 2014 by uwpressblog. Earth Day 2014: Is thinking globally and acting locally really enough? In this guest blog post, Joshua Howe challenges individuals and civic leaders to move beyond the popular “think globally, act locally” mentality and adopt more practical paths toward environmental responsibility. Howe’s book, Behind the Curve: Science and the Politics of Global Warming, explores similar civic-environmental quandaries, arguing that climate scientists’ failure to effectively engage politicians and the public has impeded our ability to respond to the climate crisis. Think globally, act locally. Since its first iteration in the late 1960s, the bumper sticker exhortation has come to represent the heart of environmental awareness in modern American culture. The slogan tells us how we as environmentally responsible middle- or upper-middle-class Americans can live ecologically moral lives, and collectively do nothing short of “save the world.” In practical terms, the sticker on that Prius you saw this morning is telling you to compost your coffee cup, think about Bangladesh, and feel just a little bit better about things. But “think globally, act locally” is actually a much bigger ask than composting your coffee cup and thinking about Bangladesh. The slogan demands that you construct a way of being in and thinking about the world that completely transcends the boundaries of normal human experience. That is, to think globally and act locally, you are supposed to use concerns about an abstract, largely scientific concept to guide your everyday behavior. We do this in practical ways all the time. When you look at a map and use that map as a guide to navigate a city, for example, your bird’s-eye-view way of thinking about the city provides a framework to guide a series of much more direct human interactions with stop lights, pedestrians, and that Prius with the bumper sticker. Your ability to marry your cartographic perspective to your street-level experience enables you to get to Whole Foods and back again with only a minimal amount of circumlocution. This entry was posted in Current Events, Environmental History and tagged climate change, Earth Day, environmental responsibility on April 22, 2014 by uwpressblog. University of Washington Press author and series editor Michael Nylan has been awarded a Guggenheim Fellowship. Nylan is the translator of Exemplary Figures and coeditor of Chang’an 26 BCE (forthcoming Fall 2014). She also coedits our Classics of Chinese Thought series. The Guggenheim Fellowship will support Nylan’s research and writing of a translation of another early Chinese text, the Documents classic, for our Classics of Chinese Thought series. This entry was posted in UW Press News on April 18, 2014 by uwpressblog. Lu Hsiu-lien’s journey is the story of Taiwan. Through her successive drives for gender equality, human rights, political reform, Taiwan’s independence, and, currently, environmental protection, Lu Hsiu-lien (who also goes by Annette Lu) has played a key role in Taiwan’s evolution from dictatorship to democracy. Unlike such famous Asian women politicians as Burma’s Aung San Suu Kyi, India’s Indira Gandhi, and Pakistan’s Benazir Bhutto, Lu grew up in a family without political connections. Her impoverished parents twice attempted to give her away for adoption, and as an adult she survived cancer and imprisonment, later achieving success as an elected politician—the first self-made woman to serve with such prominence in Asia. Below we feature an excerpt from My Fight For a New Taiwan: One Woman’s Journey from Prison to Power, which Lu coauthored with Ashley Esarey. The wail of a thousand air horns, the crackling shower of fireworks, the undulation of a sea of banners greeted us as we left our party headquarters and approached the stage. A crowd stretched for half a mile in every direction, claiming streets and sidewalks, jamming intersections on Minsheng East Road. Bottle rockets shrieked from the windows of nearby apartment buildings. To an outsider observing the revelers on the night of March 18, 2000, the crowds in the streets could have been celebrating the Taiwan national team’s victory in some sort of world championship, but the pride of the Taiwanese was participatory, not vicarious: They had voted to remove the Nationalist Party (Guomindang) from the nation’s highest office after its fifty-five years in power and had stood up to China despite its threats to invade Taiwan if they dared vote this way. They had cast aside the successors of a regime that had ruled Taiwan by force and fiat, by threat and murder, by corruption and co-optation, by autocracy and exploitation. On March 18, the Taiwanese had, through their vote, peacefully “changed the heavens” in their homeland, as the saying went, and given birth to the feeling that Taiwan was experiencing its finest hour, that the wrongs of the past could be righted. This entry was posted in Asian Studies, Book Excerpt on April 16, 2014 by uwpressblog. Miné Okubo’s Citizen 13660 is the newest book in our Classics of Asian American Literature series. First published in 1946, it was acquired by UW Press in 1983 and has been a perennial bestseller ever since. In addition to a new introduction by Christine Hong, the book underwent a radical redesign, which UW Press senior designer Thomas Eykemans walks us through here. Miné Okubo was one of over one hundred thousand people of Japanese descent—nearly two-thirds of whom were American citizens—who were forced into “protective custody” shortly after Pearl Harbor. Citizen 13660, a graphic memoir of Okubo’s life in relocation centers in California and Utah, illuminates her experience with poignant illustrations and witty, candid text. Reissuing the book created an irresistible opportunity to rethink the cover design and presentation of the illustrations of one of our most beloved and misunderstood publications. Top left: First edition hardcover jacket, 6 x 9″, 1946. Top center: First edition hardcover cloth, 6 x 9″, 1946. Top right: First UW Press paperback edition, 6 x 9″, 1983. Middle left: New UW Press paperback reissue, 6 x 9″, 2014. 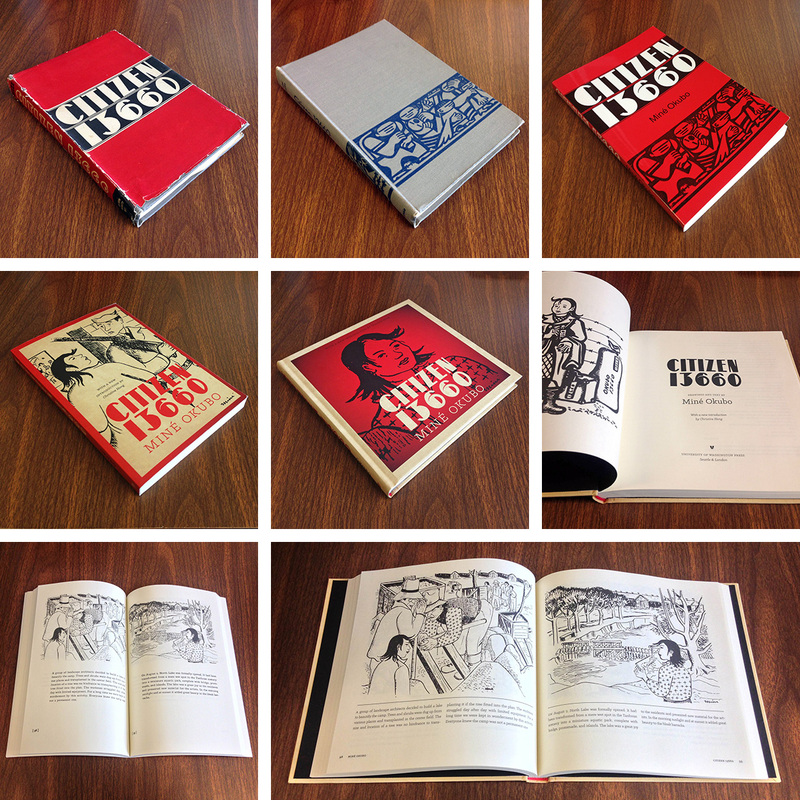 Middle center: New UW Press hardcover special edition, 8 x 8″, 2014. Middle right: Special edition titlepage spread. Bottom left: Original edition spread. Bottom right: Special edition spread. The original 1946 jacket, lettered and illustrated by Okubo herself, was both classic and practical. However, it gave absolutely no clue as to the content of the book. The 1983 paperback did little to remedy this, simply appropriating the beautiful, but misleading, case stamp from the original cloth edition. The two new editions feature details of actual illustrations from the interior, while preserving the unique and memorable deco typography of the earlier title design. This entry was posted in Behind the Covers, Book Design and tagged Miné Okubo on April 9, 2014 by uwpressblog. The Weyerhaeuser Environmental Books catalog celebrates the first sixty titles published in the Weyerhaeuser Environmental Books series under founding editor William Cronon’s direction. Authors published into the series express their gratitude for Cronon’s visionary editorial guidance and for the generosity of Jack and Jan Creighton, who have supported the series since its inception over twenty years ago. Browse the catalog and you’ll begin to get a sense of how the Weyerhaeuser Environmental Books series has shaped the discipline as well as popular understandings of environmental history. For more on William Cronon’s recent retirement as series editor, see our post Editorial Changes to Weyerhaeuser Environmental Books Series. This entry was posted in Asian American Studies, Environmental History, UW Press News and tagged Environmental History, Weyerhaeuser Environmental Books on April 4, 2014 by uwpressblog.